Jura Limestone is is a high-quality stone mined in quarries in the Bavaria region of Germany. It is perhaps the best-known stone mined in the country, and it is in strong demand throughout Europe and the rest of the world. 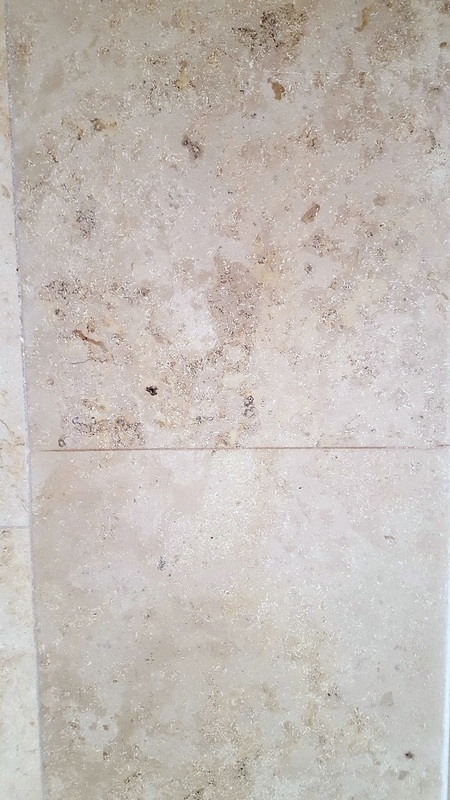 It’s not difficult to see why – this Limestone has some fantastic aesthetic qualities while also being durable and hard. This makes it a popular material for floor tiles in residential properties. 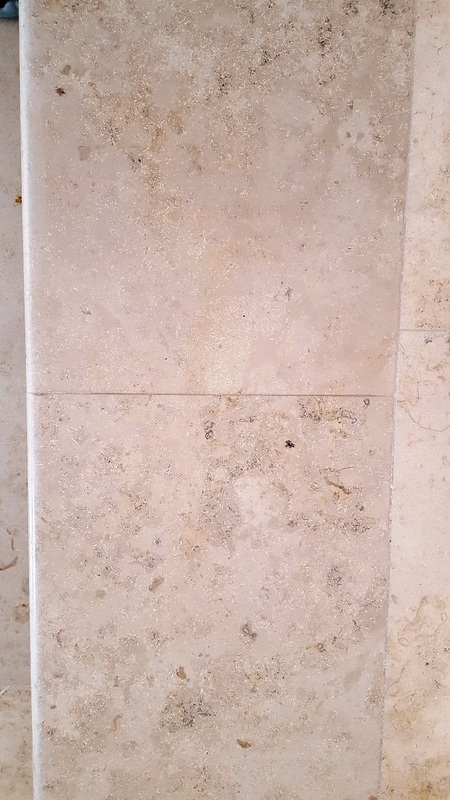 I recently encountered a wonderful coffee-coloured Jura Limestone tiled floor at a property in Beckwithshaw, a small village of around 400 people near Harrogate. Harrogate is well known as one of Britain’s best-known spa towns, and attracts many tourists each year to visit its baths. Unfortunately, the property owner had accidentally spilt a bottle of bleach over some of the tiles. Exposure to the bleach had caused unsightly white marks to appear on the stone and, upon seeing the floor in person, I noticed that the tiles had, in any case, not been polished correctly. They had, however, been sealed with many coatings of satin sealer which would need to be removed to facilitate the polishing of the floor. The floor was 150m2 and it would have been quite expensive to strip the whole floor of sealer and start again so I decided the best thing to do would be to spot treat the damaged areas. To remove the stains, I needed to use a system we have developed at Tile Doctor, which is known as burnishing. This is a style of stone polishing that involves the application of Diamond encrusted pads. Each pad in the system has its own level of grit and is applied in sequence from coarse to fine in order to re-hone the finish on the stone. To start I used two small handheld diamond blocks (the 200 grit and 400 grit) to carefully take off the old sealer in the affected areas. 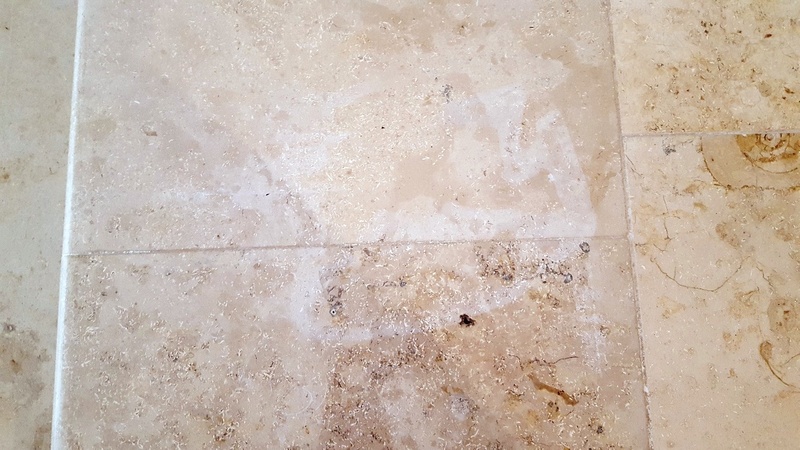 This would not be enough to remove the stains on the stone, so I followed this up with the application of the Tile Doctor burnishing system which consists of four 6-inch pads of different grits fitted to a handheld buffer. This involved starting with the Coarse 400 grit pad and then moving on to the Medium 800 grit pad, Fine 1500 grit pad and finally the Very Fine 3000 grit pad to achieve a refined polished finish. The process of burnishing removed not only the white marks, but also the very top layer of stone which had suffered from pitting. Pitting is a natural form of corrosion that causes small holes to appear in Limestone, encouraging dirt and general muck to become ingrained. Finally, the floor was rinsed and then left to dry and buffed a last time using a soft white pad. I don’t think my photographs really show the difference that well however I can tell you the result was far better than the customer had hoped for. I had managed to successfully blend the new polished finish on the affected tiles with the satin sealer which already existed across the rest of the floor.